DWA – Dreamworks Animation SKG, Inc. – Animated feature film producer Dreamworks Animation popped up on our ‘hot by options volume’ market scanner on Tuesday morning due to heavier than usual trading in November expiry calls. Trading in the Nov $30 calls suggests at least one strategist may be positioning for the price of the underlying to hit fresh 52-week highs after the company’s third-quarter earnings report after the closing bell next Tuesday. Roughly 1,900 of the Nov $30 calls have changed hands so far today, which is more than three times previously existing open interest in the $30 calls of 489 contracts. Time and sales data indicates most of the calls were purchased during the first five minutes of the session at a premium of $1.00 each. Call buyers stand ready to profit at expiration next month in the event that Dreamworks Animation’s shares rally 6.6% to exceed the breakeven price of $31.00. Shares in DWA are currently up 0.45% on the session at $29.07 as of 10:45 a.m. ET. FDX – FedEx Corp – Shares in shipping solutions provider FedEx Corporation are up strongly on Tuesday, gaining 3.0% to $131.23 during morning trading after the stock was upgraded to ‘Overweight’ from ‘Neutral’ with a target share price increase to $153.00 from $134.00 at J.P. Morgan. OPEN - OpenTable, Inc. – Shares in OpenTable are moving lower this morning, down 2.9% at $65.96 as of 11:10 a.m. ET, after analysts at Citigroup initiated a ‘sell’ rating on the stock with a price target of $58.00. Options on the provider of online restaurant reservations are more active than usual, with volume nearing 1,200 contracts versus the stock’s average daily volume of around 600 contracts. Front month put options are seeing the most action, specifically at the Jul $65 strike where more than 800 contracts have changed hands so far today. It looks like most of the $65 puts were purchased for an average premium of $1.13 apiece, thus positioning buyers to profit at expiration next week in the event that OpenTable’s shares dip 3.2% from the current price of $65.96 to breach the average breakeven point on the downside at $63.87. FDO - Family Dollar Stores, Inc. – Upside call options are changing hands on discount retailer, Family Dollar Stores, Inc., today with shares in the name up as much as 4.6% in the early going to touch a six-month high of $66.90. The company reported better than expected third-quarter comparable store sales growth and higher than expected third-quarter earnings ahead of the opening bell. The Aug $67.5 strike calls attracted the most volume during morning trading, with upwards of 3,900 contracts in play against open interest of 138 contracts. It looks like most of the $67.5 strike calls were purchased for an average premium of $1.60 apiece. Call buyers stand ready to profit at expiration next month should shares in FDO rally another 3.3% over today’s high of $66.90 to surpass the average breakeven price of $69.10. Shares in Family Dollar Stores last traded above $69.10 in December of 2012. ERTS - Electronic Arts, Inc. – Shares in the video game developer may rally to their highest in more than two years by January 2013 expiration according to three-legged bullish plays initiated in Electronic Arts options this morning. Earlier this week the company announced an agreement to acquire PopCap Games, which makes games for mobile phones, tablets, PCs and social networking sites, in a cash and stock deal valued at up to $1.3 billion. Shares in Electronic Arts are currently up 0.50% to arrive at $23.63 as of 11:30 am ET. Long-term bullish investors eyeing fresh multi-year highs by Jan. 2013 expiration appear to have sold put options on the stock in order to partially offset the cost of debit call spreads. Traders sold around 5,000 puts at the Jan. 2013 $17.5 strike at an average premium of $1.42 each, purchased around the same number of calls up at the Jan. 2013 $25 strike for an average premium of $3.67 per contract, and sold some 5,000 calls at the Jan. 2013 $30 strike at an average premium of $1.97 a-pop. Average net premium paid to initiate the three-way trade amounts to just $0.28 per contract. Investors employing the strategy profit if shares in Electronic Arts rally 7.0% to exceed the average breakeven price of $25.28 by expiration day in more than one year. Maximum potential profits of $4.72 per contract are available on the spread in the event that shares in the interactive entertainment provider jump 27.0% to trade above $30.00 at expiration in January 2013. The company’s first-quarter earnings report is expected to hit the stands after the final bell on August 2. 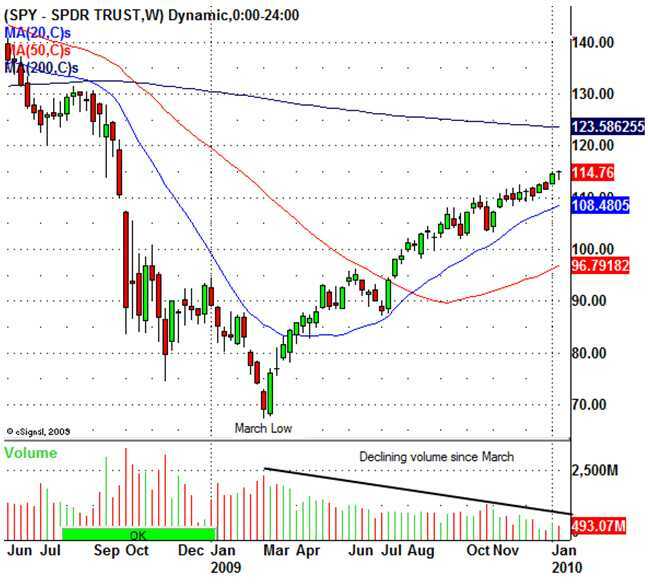 Testy Tuesday – Have the Markets Become Comfortably Numb? A distant ship's smoke on the horizon. To be shell-shocked is to be "mentally confused, upset, or exhausted as a result of excessive stress" and the most common symptoms are: Fatigue, slower reaction times, indecision, disconnection from one's surroundings, and inability to prioritize – That certainly sounds like our Congress doesn't it? Combat stress disorder was first diagnosed in WWI, when 10% of the troops were killed and 56% wounded – far worse than had been experienced in previous wars. Our current financial crisis has similarly affected more people than any previous crisis with almost everyone knowing someone who is bankrupt or lost their jobs or homes and almost no one escaped the carnage of the downturn without some financial damage. Combat fatigue may go a long way to explaining the severe drop-off in volume that has plagued the markets since March, with participation now down to 25% of where we were last January and that leaves us open to the blatant sort of market manipulation that Karl Denninger caught last week as well as the usual nonsense we get daily from HFT programs that drive the market with such precision that we are able to tell how the day is going to go by simply checking our hourly volume targets. Here's a clip from CNBC where a floor trader discusses market manipulation as a fact of trading (2 mins in). WFC – Wells Fargo & Co. – Bearish traders lumbered around Wells Fargo today purging calls and feasting on out-of-the-money put options. Pessimistic positions were initiated during the trading session despite the 1.5% move up in shares of the underlying to $29.02. Investors piled into put options at the February $23 strike where roughly 23,000 contracts were purchased for an average premium of $0.13 apiece. Perhaps put buyers are merely securing cheap downside protection in case WFC’s shares fall off the proverbial cliff by expiration next month. Traders may be expecting a pull back in shares of the financial firm. If the puts were purchased as an outright bearish bet on the stock, investors long the contracts could turn profits by selling the puts before expiration next month if premium levels on the lots appreciate above $0.13. Medium-term pessimism was apparent in the April contract where traders shed 4,700 calls at the April $32 strike for an average premium of $0.66 each. Additional bearishness took place at the April $28 strike as investors picked up roughly 5,600 puts for $1.55 apiece. Pessimistic trading patterns suggest a bumpy start to the new year for Wells Fargo. GS – Goldman Sachs Group, Inc. – Bullish activity in the February contract on investment banking firm, Goldman Sachs, suggests shares are poised to pop up in the next few weeks. Shares appreciated slightly during today’s session, rising 0.10% to $169.22 ahead of the closing bell. One optimistic options strategist purchased a debit spread to position for bullish movement in the price of the underlying. The trader bought 10,000 calls at the February $180 strike for a premium of $2.25 apiece, spread against the sale of 10,000 calls at the higher February $185 strike for $1.30 each. The investor shelled out a net $0.95 per contract on the trade. Goldman’s shares must gain approximately 7% from the current price in order for the call-spreader to breakeven at $180.95. Maximum potential profits of $4.05 per contract amass for the trader if GS shares jump 9.3% to $185 by expiration day in February.